Memorial gardens can be a peaceful and healing space to remember your loved one. 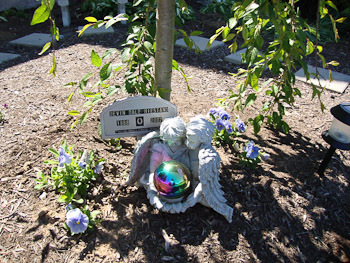 It is becoming more common for cities, communities or local Hospice groups to create gardens where the public can go and remember their loved one. However, it only takes a small space to create your own garden. After my cousin Devin died, my aunt Lucy wanted to have a space where she could be to remember him. For Lucy there was a natural location - a corner of their yard outside the kitchen window that needed some landscaping work. 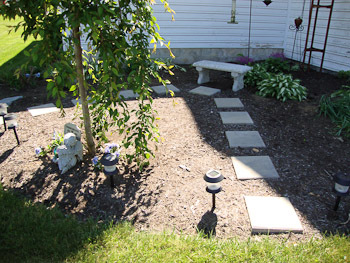 She talked to a landscaper, and he gave her a variety of ideas such as including a bench and creating a path of stepping stones to the bench. The above photo was taken soon after the work was done. She included a bird feeder, white weeping cherry tree, a few hosta, a bleeding heart bush, a marker with Devin's name and dates, and a glazing star angel. After it was finished she enjoyed spending time sitting on the bench talking to Devin, watching the birds, and enjoying the quiet. She was especially glad that they chose the area outside the kitchen because she can enjoy the garden and birds from the window as well. Last spring the garden had all kinds of Johnny Jump Ups blooming in it. Memorial gardens do not have to be large, if you do not have space. You can dedicate a small tree with a plague. An urn planter works well for a doorstep or balcony. When you are thinking about plants, spend some time thinking about what your loved one enjoyed. Did he or she have a favorite color, type of tree or flower, fragrance? Or perhaps there are certain colors or scents that remind you of them. You might also consider how a a garden statue could remind you of a joyful memory that you shared with your loved one. The running water of a garden fountain can be very soothing and calming. For me flowing water symbolizes the continual flow of life. What might be some important elements of the garden to remind you of your loved one? What elements of the garden might symbolize your loss? What are important symbols of hope or healing for you? How might you fit these into your garden? Are there specific trees or flowers that carry meaning for you? Are there other family members that might want to contribute to the planning of the garden?